Doggie Cakes – Dog Bakery and Boutique is reposting the flyer content for this event. We will not be able to attend, but make sure to catch our Dog Picnic on the 27th. Lama will give a short Buddhist Dharma talk, at Starkey Park in New Port Richey. Then, the animals will come up one by one and receive a special blessing from a sacred object and have prayers said with them especially for their benefit. If people cannot bring their animals, they can bring a picture. 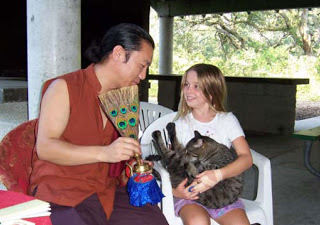 Lama says he is developing his connection more with many animals at this point and sees more and more how they are our protectors and friends and need to be cherished, as well as appreciated for their divine qualities, too. He even had one small puppy attending his classes in South India. Of her own will, she came in when the class started and left promptly after his class ended. All friendly pets or animals, their families and friends are welcome.